ANYHOW! 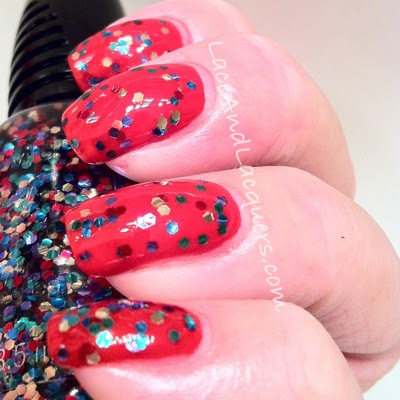 Today I have for you lovelies 2 Limited Edition polishes from Wet n Wild! Oh look at that yummy, glittery goodness! I got swatches and close ups for you guys after the jump! School of Pyrotechnics kind of reminded me of Lacquistry It's a Friggin' Circus, I think it's the colors. 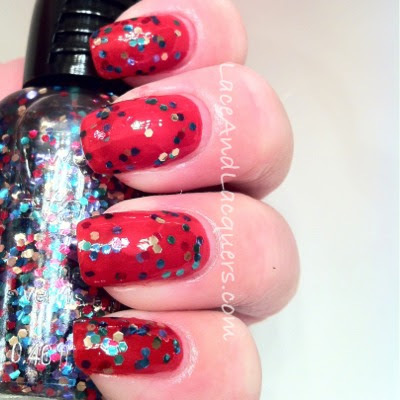 This polish has a bunch of different color of hex glitter in a clear base and is not a dupe of WnW Party of Five Glitters. There are gold, blue, green, red, and purple glitters! Like I find most WnW gitter polishes, this was a little base-y... nothing too bad though (like Spoiled Pet My Peacock, GAG ME! I'm so mad at that polish! UGH!). I did 2 coats over China Glaze Hey Sailor. Next, is Stars and Stripes! I love this! I had a small discussion about this on my Facebook and people were saying they were having issues with the glitter. This polish seems to have more base than glitter so it can be hard to catch the glitter on the brush. But, holographic stars and small bar glitter? I couldn't pass this one up! 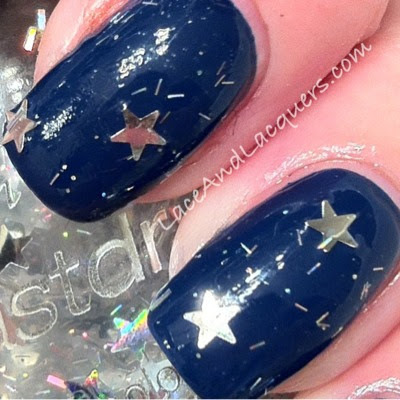 I had to make it work :] I did 2 coats of Stars and Stripes over China Glaze First Mate. I didn't find it so hard to apply... I think it was because I went in knowing some people had trouble. How did I get the glitter on my nail? I held the brush handle and made LARGE quick circles with the brush before I applied it on my nail. Do that and everything should go according to plan! I got these from Copious.com for .01. If you sign up through my link, here, you can get a FREE $10 when you connect your Facebook (and sometimes other accounts need to be connected). If you find something $10 or less (including shipping) you only have to pay the penny service charge! Not a bad deal at all :D There's tons of polish on there too: ChG, OPI, Spoiled, and more! I have heard people spotted these at Meijer stores, I can't confirm this because I've never been to, or seen, one of those stores haha! I have NOT seen them at CVS, Walgreens, or Rite Aid yet. 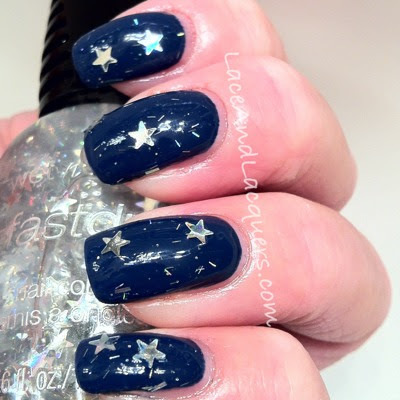 If you want to see what the LE display looks like Nouveau Cheap has some pictures on her blog. Let me know if you tried my method for Stars and Stripes, hopefully it works better for some of you who were frustrated! Love the stars and stripes! Yea i've also had problems with the glitters in the fast dry line and in the spoiled line. I could barely get the glitter on my brush. So I just decided bot to buy anymore... But Wet N Wild is one of my favorite brands. I think it's worth having! It's a fun one! 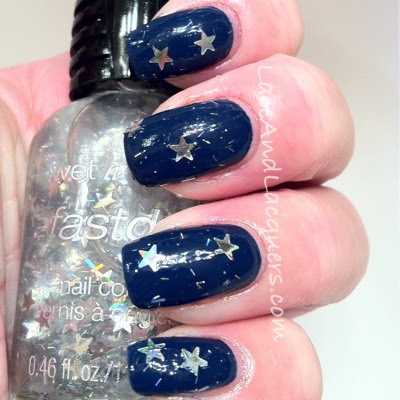 I love that star glitter! Will definitely grab it just as soon as I see it. You should for sure! :] I love it! 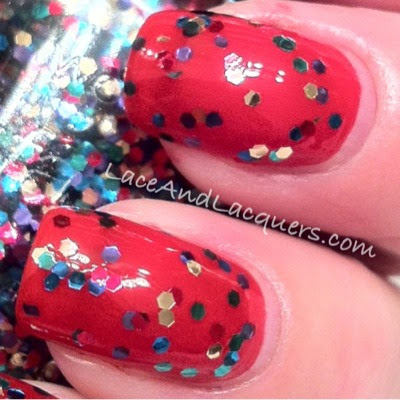 TWISTED FANTASY POLISH: Don't Turn the Lights on! New Iterms Added to My Blog Sale!